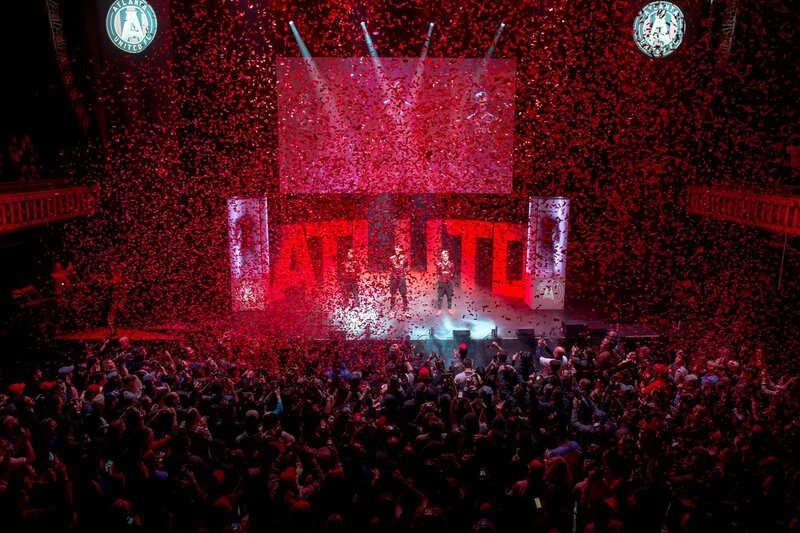 Atlanta United unveiled their 2017 home kit last night in a big celebration at the Tabernacle in downtown Atlanta. Susannah Collins from MLS emceed the event, which included Arthur Blank, Darren Eales, Carlos Bocanegra, and Mayor Kasim Reed. 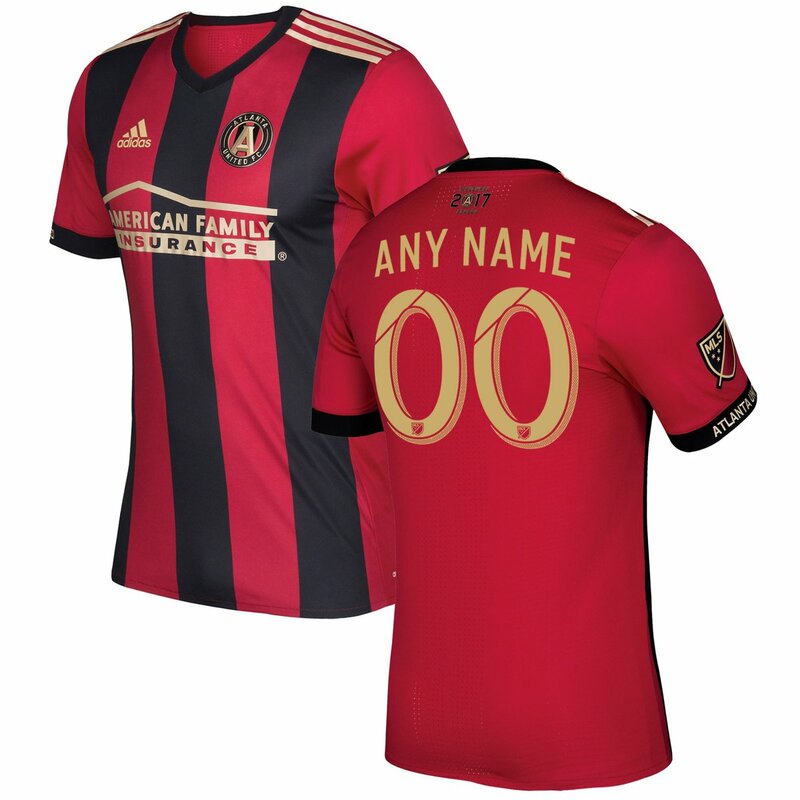 Recently I became a season ticket holder and an email hit my inbox last week about an upcoming event: the unveiling of Atlanta United’s inaugural home kit. This has been one of the most talked items about the team since the announcement. Once the logo and color scheme were released, fans and designers have been posting concept kits and discussing possible looks. I was honored to be part of the Design Football.com Atlanta United concept kit contest and fans from all over the world came up with some really great designs. On top of that, Dirty South Soccer has been accumulating designs and has made it a big topic on the Mouths of the South podcast. The general consensus was that the shirt would be similar to the AC Milan home shirt and their iconic black and red vertical stripes. After that, speculation focused on all the permutations: thickness of the stripes, striped or solid sleeves, collar/no collar, solid or striped back, trim and accent color, and finally the placement of the trademarked three Adidas stripes. Speaking of Adidas, ahead of Euro 2016, the company made a major design change, moving their three stripes from the shoulder to the torso. Adidas has a contract with MLS through 2017 and most of the kits released for the 2016 season incorporated this change, so I wondered. . . 1) where would the stripes be and b) what color would they be? After a series of speeches and cheering, Tito Villlaba, Chris McCann and Andrew Carleton stepped forward in the new strip. I loved it. Five broad stripes with gold Adidas striping on the shoulders. I would have preferred the mark on the torso but I’m over it. Two things really grabbed me: the red sleeves and the crest. Most mock ups had striped or black sleeves. The red lightens the tone of the kit and this really works for me. The A, which is the focal point of the crest, has texture on the authentic shirt, created by a series of diagonal lines. Close up the logo really jumps out and this is a wonderful feature. Another feature of the authentic shirt is the cuff, which has Atlanta United on it. Something to keep in mind when deciding between authentic and replica. Finally, American Family Insurance altered their logo to gold to complement the shirt. Had they kept their standard branding, the shirt could have gone sideways very quickly. To wrap up, I asked some Atlanta United fans their thoughts and here’s what they had to say. Heather McBrayer Cooke After some reflection, I think it’s fine. Not great, but fine. I’m never a fan of the broad vertical stripes but I do absolutely love the black shorts with the gold stripes. The detail on the back is a very nice touch as well. I honestly think the unveiling was so stinking dramatic that it set you up for a let down. Jorge E. Alonso 200% on board. Absolutely love it. 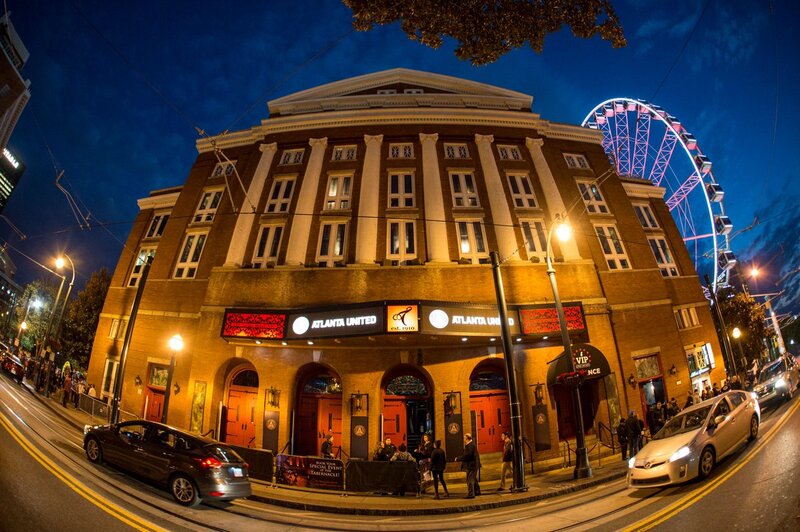 And it looks beautiful with our (Terminus Legion) scarf on it. Justin Koehn Not too shabby. I like it untucked much more for some reason with the solid black shorts. Not a huge fan of the solid color back, but overall I’d say i’m happy with it. Charles Phillips It’s exactly what we expected, but it’s executed perfectly. I like the broad bars as opposed to thinner stripes. I also think the red field on the back in place of stripes is going to look great with the number sets. The Inaugural Season flair on the back of the neck is a great touch that’ll make this particular shirt special. Part of me was hoping for the new Adidas style stripes down the torso, but the shoulder stripes work great too. I would’ve preferred some accents or design on the socks, but I can appreciate them going clean and elegant. Kelly Carter Love it. Prices are fair and comparable to the league. Design was expected but desired. Sizing runs small for authentic per usual. I’m glad the AmFam logo isn’t bigger like other sponsors in the league. Yes, it does look quite similar to the MetroStars jersey, but that was bound to happen given the color scheme. Jon Hicks Pretty damn cool. I concur with Charles the Adidas strips down the torso would have been awesome but I can live without it. The inaugural season on the back is killer. Matheus Gonçalves Some might say the kit is kind of too basic, or that Atlanta United stayed in the comfort zone and haven’t been innovative or creative enough. I understand the point but we’re not talking about Apple, Microsoft, Google that needs to innovate and be disruptive or, you know… this is a soccer team kit. 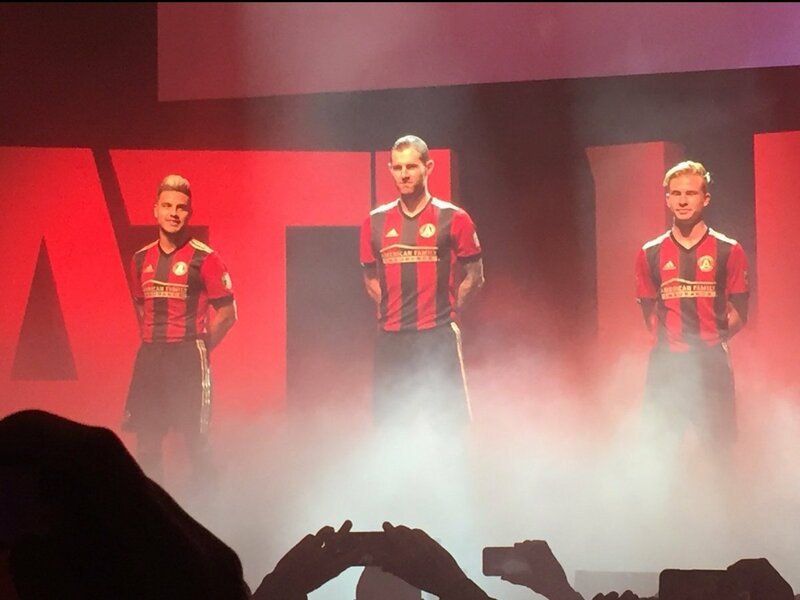 Maybe, for the future, or for the 3rd kit we could have some fading lines down the torso, or some different design but still the Atlanta United kit is classy, It’s sharp, the golden and black stripes are solid and the kit is awesome, I love it. Andy Hollums I love it! Executed perfectly. And in really glad they went solid on back. The only thing I don’t like about Montreal’s shirt is that they have short stripes at the bottom on back. I’m really glad we didn’t do that. Charlie Flint I think it’s safe and relatively what everyone expected – but a great design and looks good! Jen Pahl I really like it. It is sharp and we will stand out on the pitch. Let me know your thoughts below. You can follow me on twitter @austinlong1974 and make sure to check out the rest of the SoccerNomad blog. Also check out the SoccerNomad podcast on podomatic or on iTunes, just search SoccerNomad. I appreciate all feedback, so please leave a rating and review. TBH im upset that the logos crossover the red & Black in the Larger sizing. seems like a big oversight to me. A lot of people are like it doesnt matter and Im stupid to care about a detail like this but if im spending $100+ for an authentic I want to look like the players. I think it is a major issue by Adidas its a 1/2″ to the right fix. I love the jeresey but that detail. I understand your frustration. Not sure it’s oversight but more of a design issue. As I understand it, the small and medium sizes have the crest on the red stripe. The larger sizes have it half and half. With more fabric and larger surface, this may be the reason. Not saying it’s right. I will look at my Juventus kits tonight and see what they did. I would also suggest looking at AC Milan/Juve/Inter shirts down the years to see if this can be avoided. Thanks for reading and commenting and hope to see you at Atlanta United events (or even #ATLSoccerCon 2017) in the near future. Hey, so overall I like the new kit. I went with an official one because I wanted the long sleeve and the extra detailing. The only “down side” is that I wish it was done like the Seattle kits where it still has the band where the short sleeve would end. 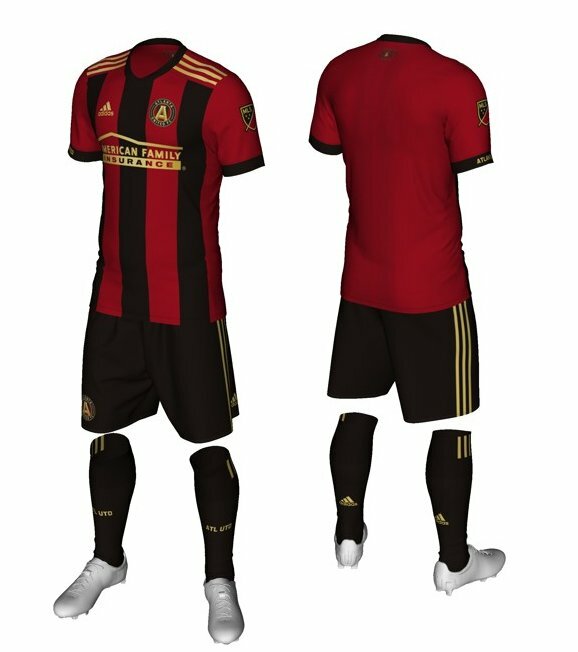 That way we could have gotten the Atlanta United on a sleeve as well. Classic Football Shirts Old and new football shirts for sale. Wide range of clubs and large selection.